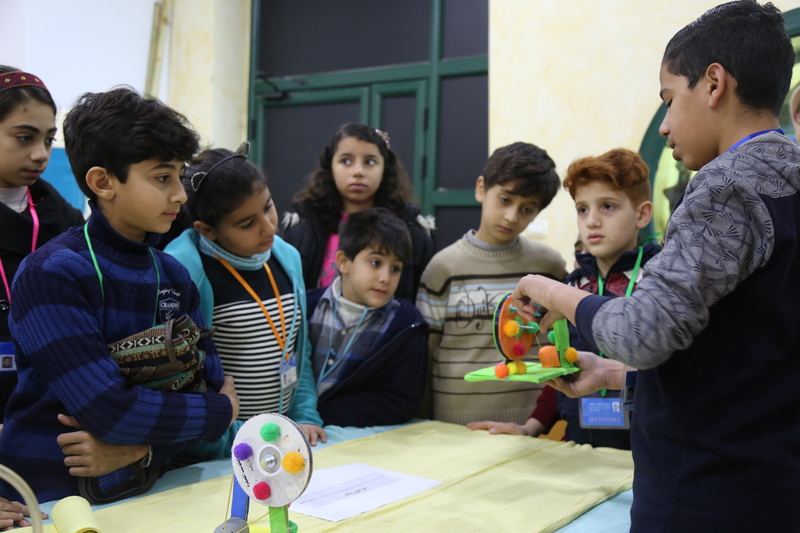 On 22 January 2019, the Child Centre – Gaza (CCG) / A.M. Qattan Foundation organised an interactive science exhibition at the CCG premises. The exhibition provided a free science space, in which participants interacted with visitors, including parents and children. CCG children exhibited the science projects, which they had developed during their participation in science courses and activities. These included the Make it Yourself and Fab Lab activities. The CCG organised these activities in the Winter 2019 events, which were launched in conjunction with the winter break. The exhibition featured science projects designed and implemented by children. Revolving around the theme of Renewable Energy, science projects tackled problems that face the world and the current energy crisis that affects societies both locally and internationally. Most prominent of science projects was the Electricity Generator, an output of the Make it Yourself course. The project involves a simple device, which transforms kinetic energy into electric power by rolling a wheel. Abu al-Nour made a presentation to parents and children about the parts and idea of the project. He explained that the project would help resolve the problem of power shortage in the Gaza Strip. Children, who engaged in the Fab Lab activity, exhibited the Hydrogen Cell project. The team managed to create a hydrogen cell, which decomposes water into constituent elements (oxygen and hydrogen) by passing an electric current through water. Using a battery, the electric energy source is then removed, uniting hydrogen and oxygen atoms together. The result is energy which humans can benefit from. In addition to interactive science exhibitions, the CCG organises a set of scientific activities, programmes and courses all year round. These are tailored to promote design, innovation, and exploration.